A Rochester degree does not come easy. We attract students who are smart, intellectually curious, and eager to make their mark on the world. Students who embrace the challenge of Meliora should be able to pursue their ambition to the fullest extent of their potential. University alumni, parents, and friends made that even more possible by removing financial limitations and improving the overall student experience. 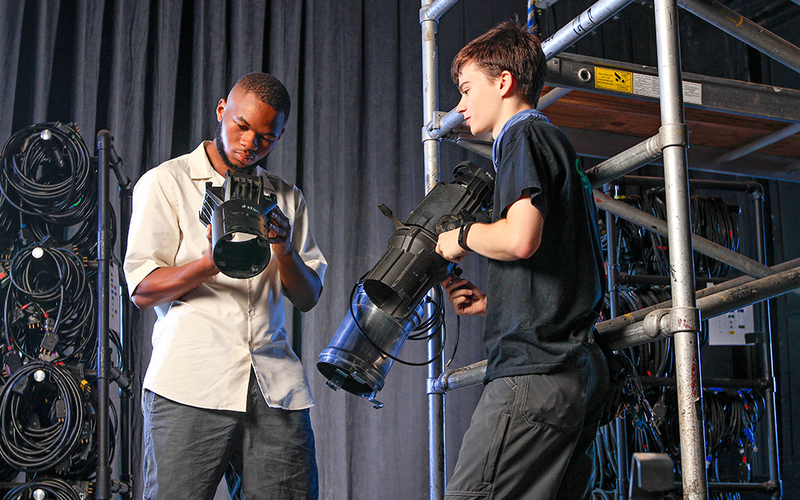 Todd Kelmar '17 shows Prosper Feya '18 how the lights work in Todd Theatre. Scholarships have removed limitations on students' ambition, allowing their dreams to take center stage. An electrical and computer engineering major and theatre minor, Feya is making the transition from on stage to back stage in Todd Theatre. The new focus on stage management is part of his plan to both help implement sustainable energy solutions and build up the theatre program in his hometown, Masvingo, Zimbabwe. Feya’s ambition was given extra muscle by his Alan and Jane Handler Scholarship. This premier University scholarship, given to those with exceptional academic potential, financial need, and outstanding leadership potential, is allowing him to take very real steps toward his goals for the future.